3) Why organise a climate camp? Call to Action: Dignity, Autonomy, and Solidarity over Greed and Corporate Power! The misery, marginalization, and impoverishment forced on millions by the International Monetary Fund and World Bank is unacceptable. Superfluous and Superheroes of the World: Unite and Take Over! Hundreds of us met in Venice during Global Meeting. 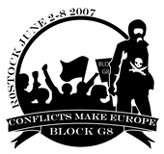 Block the G8 Summit, By Any Means Necessary! 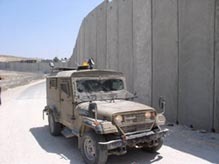 Call for border crossing infrastructure! At the international meeting in Warsaw there was a meeting being held on border crossing issues and on the setting up of international Infopoints. 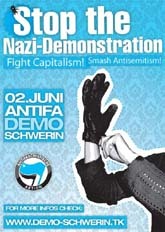 An impressive number of groups in Germany and outside is currently preparing to effectively blockade the G8 summit this June. At least they will try to, they are, of course countered by a large police force that will try and stop them. The 17th of April is the International Peasant's Struggle Day, establishedafter the massacre of 19 landless peasants belonging to the Landless Movement(MST) in Brazil on the 17th of April 1996 during the second conference ofLaVia Campesina in Tlaxcala Mexico. G8 Heiligendamm 07: just another counter-summit? BLOCK G8 - MOVE. BLOCK. STAY. Trade Unions on to the global arena! summit meetings are symbols of world-wide neoliberal dominance. World economic summits serve global coordination and division of power. That way they stabilise the neoliberal world economic order with its ever worse consequences for the majority of the people. An elitist minority in that context appropriates the wealth that millions of people produce. At the beginning of June 2007, the heads of state and government of the eight largest economic powers will come together for the G8 Summit in Heiligendamm near Rostock. As an act of civil disobedience, we will blockade this Summit. Our reason: The politics of the G8 stand for neoliberal, globalised capitalism, which dramatically increases the gap between the rich and poor worldwide. With the "Block G8" campaign, we say "No!" and reject the legitimacy of the G8! Send the G8 to the bottom - Once and forever! Puff away the G8 Summit! From the 6th to the 8th of June 2007 the leading representatives of the seven richest countries and Russia will gather in the german state of Mecklenburg-Vorpommern for the so called G8-Summit.